In this study, effectiveness and sensitivity of ultrasonic through transmission C-scan and X-ray radiography methods for the characterization and classification of defects unique to honeycomb structures were analyzed. The specimens with built-in defects were fabricated and tested by Automated Ultrasonic Scanning System (AUSS) and X-ray film radiography. AUSS provides significant information which can be used to identify and size most of the defects such as planar voids, core damages and water/hydraulic fluid intrusion into the core. X-ray radiography was found to be a reliable NDI technique for defects such as core damages, water/hydraulic fluid intrusion into core and air gaps that might occur in filler adhesive. 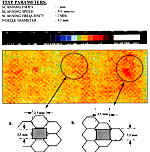 When used together, these two techniques were found sufficient for the detection and characterization of most defects encountered in honeycomb structures. Ultrasonic method can be used to detect porosity, delaminations, adhesive bonding voids, core defects and foreign materials in honeycomb composite structures. Immersion or water squirter through transmission techniques are considered as the most effective because they provide efficient and relatively uniform coupling between the search units and the test piece. In this experimental study, Automated Ultrasonic Scanning System (AUSS) was utilized to characterize defects in honeycomb test specimens. This is a computer-controlled ultrasonic scanning and data collection system to provide a solution to the high cost of ultrasonic inspection of composite aircraft structures. The use of computers to control the scanning and data-handling functions not only reduces the cost but also provides a tool which goes beyond the detection of flaws and contributes significant information. The data handling and colour display capabilities permit an overall view not obtainable with conventional ultrasonics, while also permitting a detailed evaluation of local areas, all with a single scan of the component. As a composite specimen is being scanned, the loss in amplitude of ultrasonic waves over the component is converted to colour image displayed on the monitor which enables a real time inspection. 14 different colours are available to represent the losses in dB range. By increasing or decreasing reference gain (in dB) the colour coded image can be customized to view the desired dB ranges. X-ray radiography is particularly useful for the detection of core defects in bonded sandwich honeycomb assemblies. The low density and thin composite skins usually provide easy penetration for the X-rays to image the honeycomb core materials. Core defects such as blown core, condensed core, corroded or cut out core, and foaming adhesive voids can be detected by X-ray radiographic method. 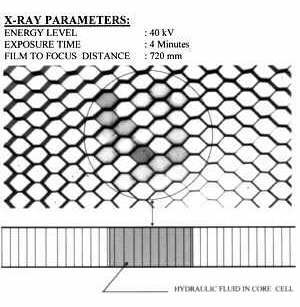 It is also possible to detect water intrusion into the honeycomb core by X-ray radiography. Some adhesives such as AF-55 and FM 400 are X-ray opaque, allowing voids and porosity to be detected in metal-to-metal bond joint. This is extremely advantageous especially for complex geometry joints, which are difficult to inspect during fabrication. For maximum contrast, radiographic inspection of adhesively bonded composite parts should be performed at low energy values using an X-ray tube with a beryllium window. Film packaging should be given special consideration because the image of the cassette superposes on the film at those energy levels. Nowadays, specially designed automated real-time X-ray systems are also used for inspecting aircraft components made of bonded composites. Remotely controlled material handling and X-ray system allows operator selection of video recording and radiographic capabilities in automatic and manual modes. fine grained film, manual processing. The processed films were later scanned by a scanner. They were printed after customizing their size and contrast by a computer. The images on the X-ray film were converted to black and white pictures on white printing paper. Test specimens that were tested in this study represent some panels used in AH-1W helicopter. The specimens had built-in defects that are typical of honeycomb sandwich structures. The Specimen A had two built-in skin-to-core cell size disbonds (voids). These cell size voids were generated by placing two 0.3 mm thick cell size teflon strips between the core and the adhesive film. One of the two teflon strips was placed as a lid to cover the cell cavity and the other one was placed on the cell walls of four neighbouring cells. The teflon strip covering the cell cavity simulated a void of cell size whose centre coincides with the centre of the cell cavity. 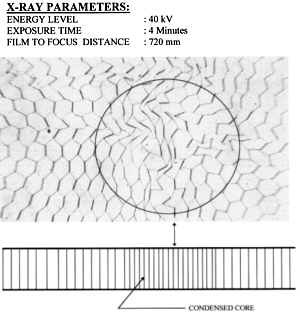 The other teflon strip simulated a void as large as a cell whose centre coincides with cell walls. The objective of fabricating Specimen A was to determine the sensitivity of the ultrasonic through transmission technique in the detection of cell size voids at two different orientations. The Specimen B had built-in core defects in the form of a crushed, corroded and condensed core. To simulate crushed core, honeycomb core was crushed by inserting a 45 mm diameter, 0.25 mm thick metal disk between the skin and the core and then applying pressure. Corroded core was simulated by keeping the aluminum core in sodium hydroxide diluted with water (MIL-C-46156) for a few minutes. The core was removed just before the walls start to separate and distort. Finally, condensed core was created by distorting the core cells laterally by pressing a finger on the cell walls and moving sideways until the shape of a considerable number cells were completely distorted. The Specimen C had insert with built-in filler adhesive gap. Simulated air gap was produced by placing a 1 cm diameter nylon air bubble inside the insert cavity and then injecting the adhesive until the cavity was thoroughly filled so that a steady flow of the adhesive was coming from the other hole of the insert. The Specimen D had a nomex core and simulated water and hydraulic fluid intrusions. Water and hydraulic fluid intrusions were simulated by injecting different amounts of water and hydraulic fluid into the core cells through injection holes drilled on the upper face of the panel. Core cells were filled with respective fluids to more than half of the panel thickness. The aim was to determine the reliability and effectiveness of NDI techniques in the detection of fluid intrusions that would develop in honeycomb structures. Figure 1 shows the C-scan image of Specimen A which has cell size voids. Image of the void which coincides with the centre of the cell cavity is located on the left hand side (Fig. 1a). The image of other void is the one encircled on the right (Fig. 1b). The image of the void that covers the cell cavity has almost the same colour as the adjacent areas, so this void could not be detected by the AUSS. This is expected because by through transmission technique, detection of adjacent voids in the direction of sound propagation is not possible. Ultrasonic energy is almost completely reflected at the first interface and the amplitude of transmitted signal is very close to that of the level obtained for neighbouring cell cavities. However, the same size void which covers the cell walls created an image which is almost four times the actual cell size. It is very clearly illustrated in Fig. 1b, where four cell cavities were combined to form a void close to four times the single cell cavity. It can be concluded that in a bonded honeycomb panel, a planar void as small as the cell size could only be detected if it completely or partially covers the cell walls. Depending on the orientation of the void, the size of the image can be as much as four times the cell size as shown by this experiment. It is also apparent that even sufficiently bonded areas have a colour image which is non-uniform. We surmise that these non-uniformities are due to variations in the bond line quality. Poor bond line quality might be caused by poor surface preparation and/or insufficient or non-uniform pressure distribution applied to the specimens during curing cycle. This type of bond line failure may not be detected by any other conventional technique. On well bonded areas the cell cavities create uniformly distributed small size void images showing the texture of the honeycomb structure. The operator should be aware of the construction details of the assembly being tested and should not misinterpret void images due to cell cavities. The non-uniformities caused by the variations in bond quality and cell cavity exist almost in all of the scans shown in Figures 1 through 6. 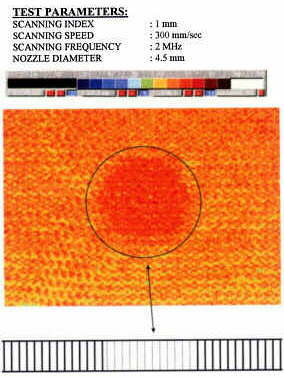 Figures 2 and 3 show respectively the colour C-scan images of water and hydraulic fluid intrusion into nomex core. The size and location of these defects were completely detectable. As expected, in comparison to the void, the loss in the transmitted signal amplitude across both the water and the hydraulic fluid was less than that of adjacent areas. The average loss of transmitted energy was in the range of 30-50 dB for water and 24-50 dB for the hydraulic fluid. Intrusion of water and hydraulic fluid can be distinguished from each other by comparing gain values. The average loss for hydraulic fluid being less than that of water indicates that hydraulic is a better transmitter of ultrasonic energy. Figure 4 shows the image of a condensed core. The signal level is in the range of 50-60 dB for condensed core region and 60-70 dB for adjacent areas. By condensing the core cells, the shape of the cell cavities were distorted and the loss in the transmitted ultrasonic energy was recorded to be less than that of the neighbouring areas. 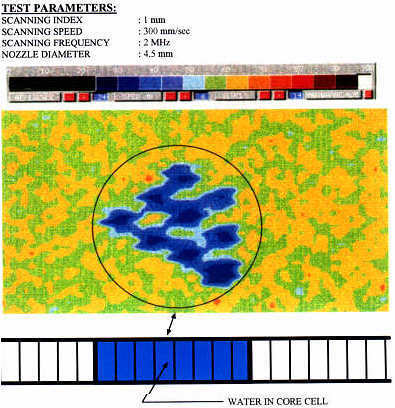 Figure 5 shows the image of the crushed aluminum core created in Specimen C. For this case the loss in the transmitted signal level was in the range of 55-65 dB for non-defective area and 70-80 dB for crushed area. The signals were highly reflected at the aluminum/air interface. The crushed core type defect could easily be detected by comparing the colours and gain. 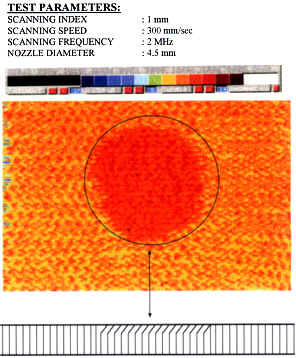 In Figure 6, the C-scan image of corroded core is illustrated. This defect could also be detected by the AUSS. 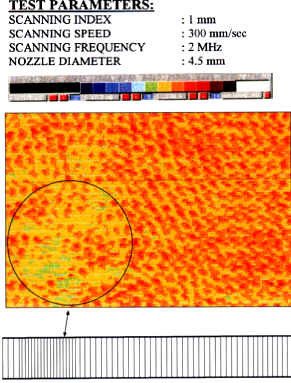 The average loss in the transmitted signal level was in the range of 65 to 75 dB for the corroded area. The signal level over the non-defective areas was again between 55-65 dB. Degraded material properties and bond line quality caused by simulated corrosion lead to poor transmission of the ultrasonic energy. 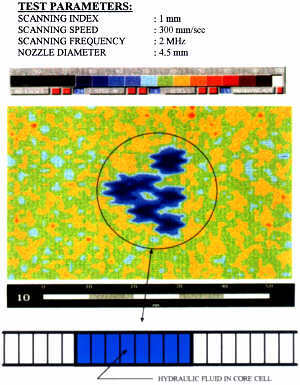 Figure 7 shows the positive print of an X-ray radiograph of water intrusion into the honeycomb core. Since radiation is absorbed by water as it penetrates through the specimen, it forms a contrast with the adjacent cells. This made the presence of water easily detectable. Fig 7: Print from X-Ray Negative Showing Water in Core. Fig 8: Print from X-Ray Negative Showing Hydraulic Fluid. 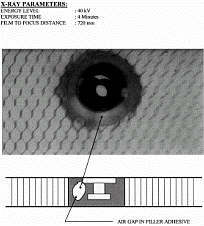 Figure 8 shows the positive print of X-ray radiograph of hydraulic fluid intrusion into honeycomb core. Similar to the case of water, since hydraulic fluid has different absorption characteristics from those of the surrounding cell cavities it produces an image of the hydraulic fluid on the film. 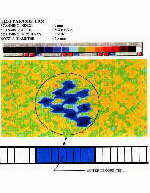 Positive print of the X-ray image of a condensed core is given in Figure 9. It is clear that any distortion or shape change of cells which took place in lateral direction could easily be detected by X-ray radiography. Printed X-ray image of a crushed core is shown in Figure 10. Since the buckled cell walls could not produce a significant increase in the total thickness, the corresponding contrast was low. However, with trained eyes and enough care in the evaluation of the radiograph, crushed core can be also detected. Fig 9: Print from X-Ray Negative Showing Condensed Core. Fig 10: Print from X-Ray Negative Showing Crushed Core. On the other hand, since the extent of the damage was not significant, i.e. core walls were intact, it was not possible to detect the corrosion in the core by X-ray film radiography. This was considered to be due to insufficient decrease in the thickness of cell walls to produce enough contrast to make them perceivable among surrounding cells. 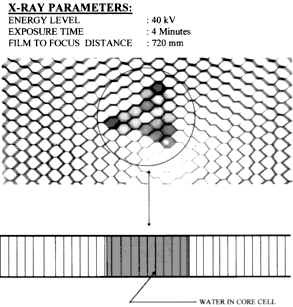 Figure 11 displays positive print of the X-ray image of an air gap in filler adhesive. In contrast to the through transmission ultrasonic technique, air gap in filler adhesive could be detected by X-ray radiography. Since the introduced air gap decreased the total thickness of the filler, it lead to a local variation in the contrast. Fig 11: Print from X-Ray Negative Showing Gap in Adhesive. In this study, it was aimed to analyze reliability and sensitivity of the selected NDI techniques for various built-in defects that are specific to honeycomb panels and to establish a correlation of NDI results. Simulated defects were generated in reference specimens and then inspected by ultrasonic through transmission C-scan and X-ray radiography. The automated ultrasonic scanning system (AUSS) proved to be a reliable method for the detection of most defects. The use of computers to control the scanning and data-handling functions provided a tool which goes beyond the detection of flaws, and contributed significant information which can be used to characterize and classify many types of defects. 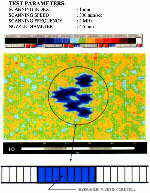 AUSS enabled the detection of built-in-defects such as voids, core defects, and water and hydraulic fluid intrusions into core by mapping them on a colour plan view. The real-time and permanent colour C-scan image display provided a convenient tool for presenting ultrasonic data in a manner which can easily be understood and interpreted. AUSS was found to be sensitive to voids as small as the size of a single cell provided that the void is not located on the top of the cell cavity. However, the minimum detectable size of a void by air contact through transmission C-scan is reported to be twice the cell size. AUSS could also differentiate intrusion of water from that of hydraulic. The only defect that could not be detected by the AUSS was the built-in gap in the filler adhesive. This is thought to be due to the high attenuative nature of the filler adhesive which completely masks the air gap in it. As a result, AUSS can be used as a primary non-destructive inspection tool not only for the detection of bond line defects but also for core defects such as crushed core, corroded core, water/hydraulic intrusion into core. X-ray radiography technique was found to be very efficient in detecting core defects such as, water/hydraulic fluid intrusions, crushed core, condensed core, etc. In contrast to the AUSS, the entrapped air gap in filler adhesive could easily be detected by X-ray radiography. A Marshall, 'Sandwich Construction', Composite Handbook, Chap. 21, pp. 557, 1988. D E W Stone, 'Non-Destructive Inspection of Composite Materials for Aircraft Structural Applications', Brit. J. NDT, pp.65, 1978. T S Jones and H Berger, 'Application of Nondestructive Inspection Methods to Composites ",Materials Evaluation, Vol.47, pp.390, 1989. D J Hagemaier and R H Fassbender, 'Nondestructive Testing of Advanced Composites', Materials Evaluation, Vol.37, pp.43, 1979. 'Adhesive Bonded Metal Faced Sandwich Structure Acceptance Criteria' MIL-A-83376, June 1978. 'TM 55-1520-236-23, Intermediate and Organizational Maintenance Manual of AH-1E, F, P Cobra Helicopter', pp.2, May 1980. 'TM 55-1520-210-23, Intermediate and Organizational Maintenance Manual of UH-1H Utility Helicopter', pp.2, September 1987. A J Rogovsky, 'Development and Application of Ultrasonic Dry-Contact and Air-Contact C-Scan Systems for Nondestructive Evaluation of Aerospace Composites ",Materials Evaluation, Vol.49, pp.1491, 1979. 'Nondestructive Inspection of Adhesive-Bonded Structures" ASM Handbook, Vol.17, Ninth Edition, pp.611, 1996. T S Jones, 'Inspection of Composites Using the Automated Ultrasonic Scanning System (AUSS)",Materials Evaluation, Vol.43, pp.746, 1985. 'Adhesive Bonding for Aerospace and Other Systems, Requirements' MIL-A-83377, October 1978. D J Hagemaier, A H Wendelbo, Jr., and Y Bar -Cohen, 'Aircraft Corrosion and Detection Methods', Materials Evaluation, Vol.43, pp.426, 1985. 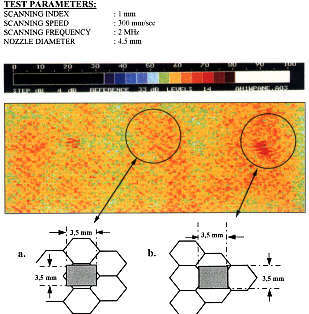 M T Wilcox and D L Hanson, 'Real-time Fluoroscopic Imaging System for Honeycomb Bond Structures'Materials Evaluation, Vol.39, pp.844, 1981.